CBSE Board Hindi Core Topper Answer Sheet for class 12 students, this answer sheet the best Hindi core answer sheet form 2016-2017 board examination. This topper paper help students to avoid mistakes, helps in what should be the strategies for board exam? How to plan things in paper? You can view and download this answer paper and understand how you should represent your Hindi core paper in examination so that you get full marks 100 out of 100 marks in C.B.S.E. board Examination. This answer of Topper gives your idea where to focuses more and where not to waste time in exam and how to write in the answer sheet in Final board exam. You can also become the topper of CBSE 2018-2019 class 12 in Hindi Core by looking at previous year topper answer sheet. The CBSE Hindi Core topper answer sheet of class 12 student will help to you write better and efficiently in your CBSE board exams. As CBSE chose the Best answer given by previous year students so, you can follow the answer sheet, and wright and practice the handwritten solution. Download the Topper answer sheet of English Core issued by cbse.nic.in. Today you’re going to see how you can grew your Hindi subject marks by 59% by just going through the toppers answer sheet of 12th class. The best part is the solution is free of cost and you can download the topper answer sheet in PDF format. And in this answer sheet I’ll walk you through the step-by-step process that the topper has used during his/her CBSE board examination. Hand writing is huge factor for Hindi or English papers, it’s a huge difference in good hand writing and bad writing when examiner examines you boards answer sheet. So to succeed on CBSE results, your answer should be neat and clean. Another factor is grammar mistakes, spelling mistakes and misused words examiner also see this factors while checking your boards paper. One thing more you should write the answer of the given question according the marks allocated to the question. 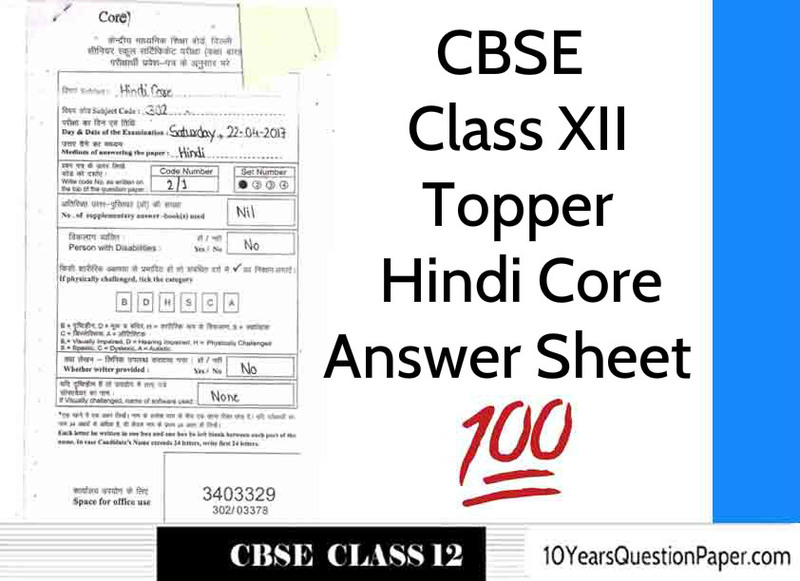 Above I have compiled the Hindi Core topper answer sheet in PDF format have a deep look at the answers given by the topper and the marking pattern by examiner.